Double Fine Productions and Electronic Arts are still on for a planned Rocktober 13th release of the metal epic adventure Brütal Legend. To prove that the game will ultimately be reality, EA has released hard-rockin' box art for the game. 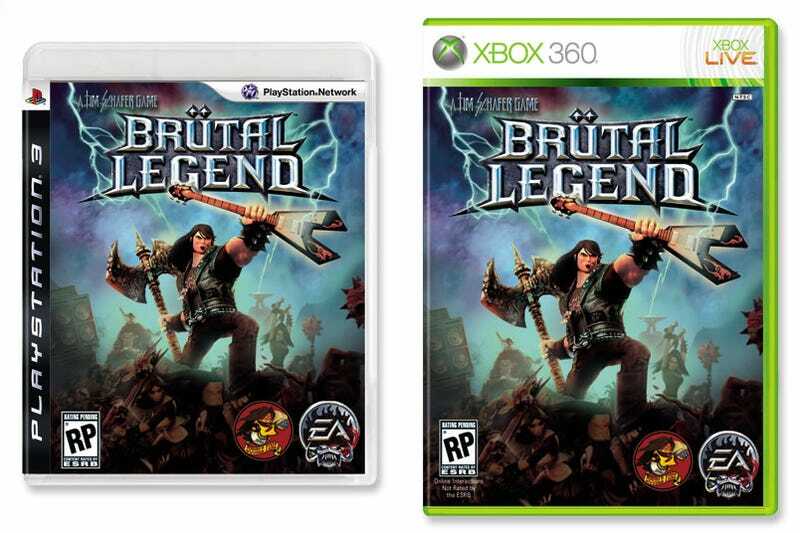 The PlayStation 3 and Xbox 360 box art gets double badged with extremely metal Double Fine and EA logos, with creator Tim Schafer getting top billing in a Slayer-esque typeface. There's lightning, leather and metal, beveled umlauts and the type of double axe-wielding metal fantasy that empowered us in our metal loving youths. Curiously missing from the game's cover is mention of its big Hollywood superstar Jack Black and any of the numerous cameos. Guess we'll have to wait for the back of the box to see Mr. Black and company's name in promotional print.. Box arts of legendary size await you after this!